South East Business Boost (SEBB) is a new government initiative grants programme that sits as an autonomous company within the council and offers local businesses support to help them develop. 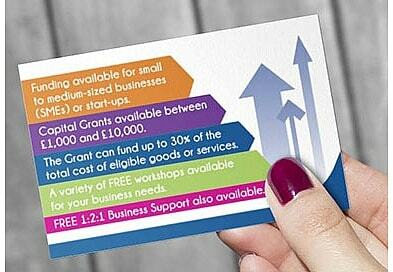 Being a new initiative, things were moving fast and the team at Southend needed a set of business cards designed quickly. Emma had to find someone that she could trust to provide top-quality work with a speedy, problem-free turnaround, all at the best price possible. As SEBB is funded by the EU, both the SEBB and EU logos had to be used. Unusually, they were also to be given equal visual prominence. 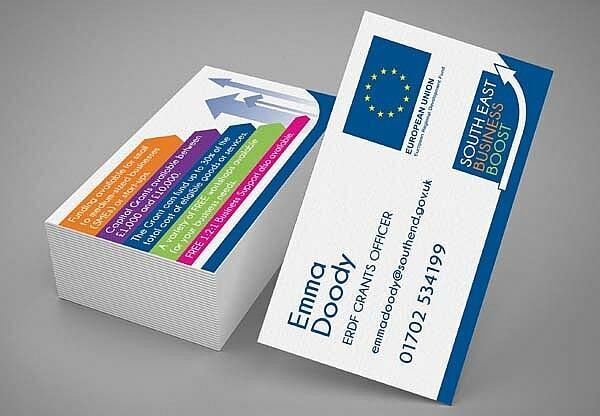 We provided Emma with a balanced first draft to brief that incorporated both of the logos on the back of the card. She then provided us with an A5 publicity flyer that was being used to promote their services and asked if we could try an alternate design that incorporated the same elements. This gave us scope to move the logos to the front of the card and produce a far more colourful and eye-catching design for the back that allowed the business card to also function as an effective advertisement. This second design was readily approved and we commenced producing the complete set of cards. Emma has returned to us for additional cards as the SEBB team has grown. The service from Oracle Creative Media has been exceptional from the start. 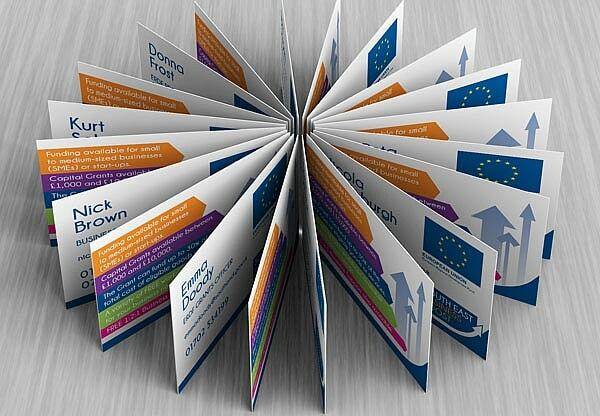 Their design work really made our business cards stand out, and their staff gave a personal service throughout. We continue to use Oracle, and it has been of a high standard every time. I would thoroughly recommend their service!